Well, we did it. He did it. It was lovely. I spent a good part of the week worrying about when to arrive. We wanted good seats, you know. The gym opened at 10, an hour before the ceremony, and when we got there at 9:45 the line was already out the door. Still, we were about 8 rows back (and on the aisle, which was what I wanted for taking pictures). The chairs were darned uncomfortable, so we got up and moved around and chatted with people a lot to pass the time. Cal said the waiting was long for him too. A friend he hadn't mentioned much all year invited him to spend the night this week, and when we asked him about it Cal said, "Oh we were always friends, but we really got close after standing in line next to each other for FIVE HOURS." It was fun to watch the room fill up. 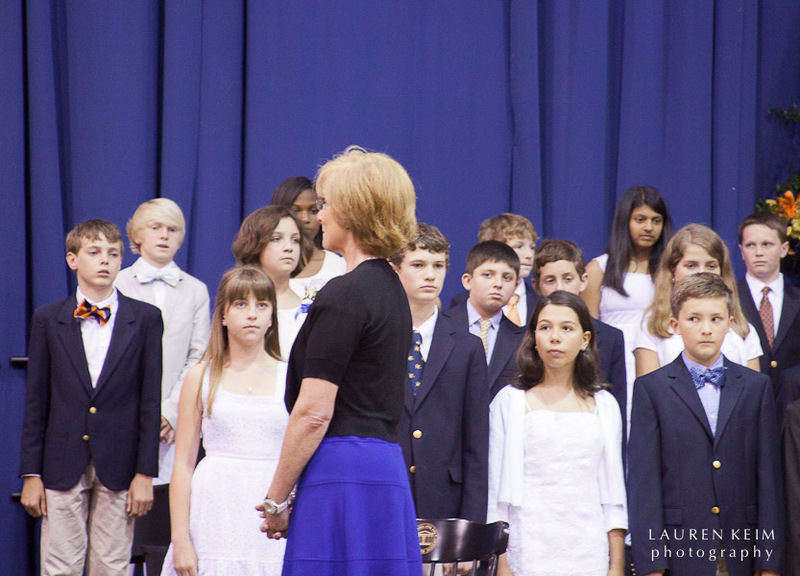 The entire Lower School comes to the 6th Grade Graduation, so it's quite an event. As we crept toward 11, the room was packed. 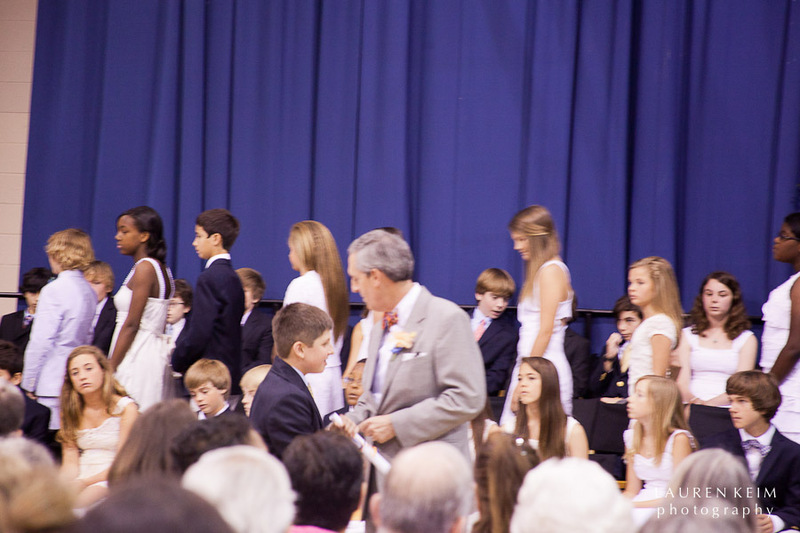 Right at 11, the kids started processing in...to Pomp and Circumstance, of course! That's Cal's homeroom teacher on the left there. Best part of his year. Cal kept his eyes down like that the whole time, and that surprised me. He's a pretty confident kid. Turns out, his best bud tackled him after their class picture that morning (and before the ceremony), and Cal had grass stains on both his knees. We couldn't see a thing, but he was worried. The girls wore white dresses and the boys wore ties and blazers. Some in that Southern summer staple of seersucker, but Cal went with another Southern staple, blue blazer and khaki pants. They sat boy-girl-boy-girl in alphabetical order. They practiced standing up and sitting down by rows all week, and that's the Lower School director is standing in front; she's a delight! "Will the second row please stand up?" And it's official! Cal gets his "diploma" from the headmaster, shakes his hand and says, "Thank you very much." The smile of relief on his face is vast! Once all the kids are through (and they sat down in tandem), we gave them a well-deserved standing ovation. Sixth grade is hard. They deserve some praise. The headmaster of Cal's school is a wonderful and witty speaker (and a mean three-point shooter to boot). 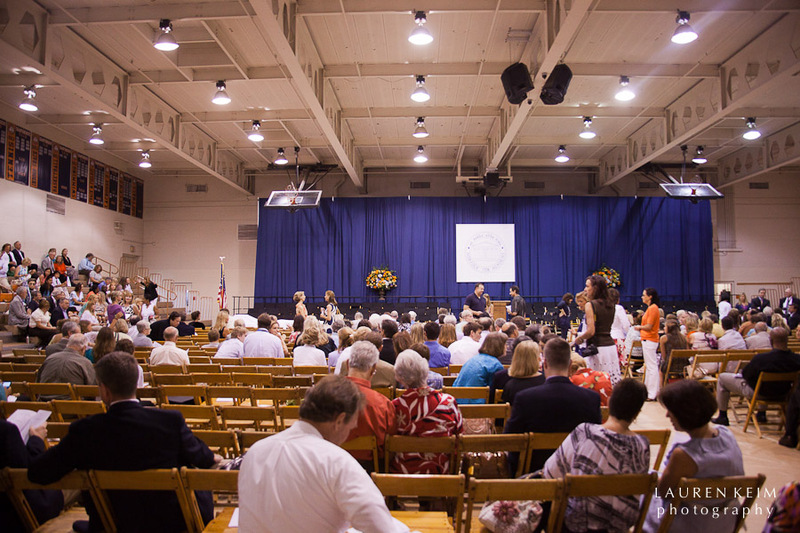 He noted that just a week earlier the real graduates, the class of 2012, sat in that very room as they prepared to leave this school forever. Dang. Six short, short years from now. He spoke again, once all the diplomas were handed out, and likened himself to Hoover Dam, holding back the tide of summer. We all chuckled at the truth of that comment (you could practically see the kids straining to push themselves out of their seats! ), and then he paused and said, "It reminds me of Keats..." Now that got the real laugh! Couldn't you just picture yourself as a 12 year old kid, fresh out of lower school, and your headmaster wants to talk about Keats? His point was valid though, and it's one I often make. One of life's best pleasures is the pleasure of anticipation. I couldn't agree more. What happened after that was a whirlwind. We lost Cal at the reception, but managed to snap a shot of him and his homeroom teacher. We ran him home and slammed some lunch in him before getting him to the 6th grade pool party. After the 6th grade pool party was baseball practice, and finally, finally home again. What he'd been waiting on all day. 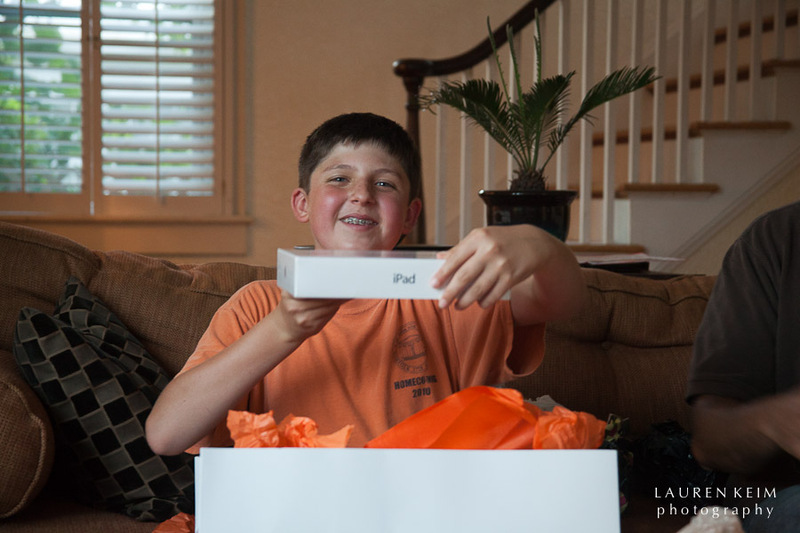 Everybody chipped in, grandparents and parents alike, and gave this boy his wildest dream (even more than a phone?). Happy camper. He'd sleep with it if he could. And then we had a party. The tenor of this event changed considerably from when I first conceived it, but I'm trying to learn how to be flexible. Bottom line is that Callum felt celebrated and some of our favorite people were there with us. That's all that really matters, right? Fried chicken, corn hole and iTunes gift cards. Who could ask for more? One of the things we love about Callum's school is its emphasis on the whole child. They care as much about developing a kid's character as they do their academic skills. This can be a challenging concept for a 12 year old boy who is still managing to figure out how to control his impulsiveness all the while juggling predicate nominatives and pre-algebra. 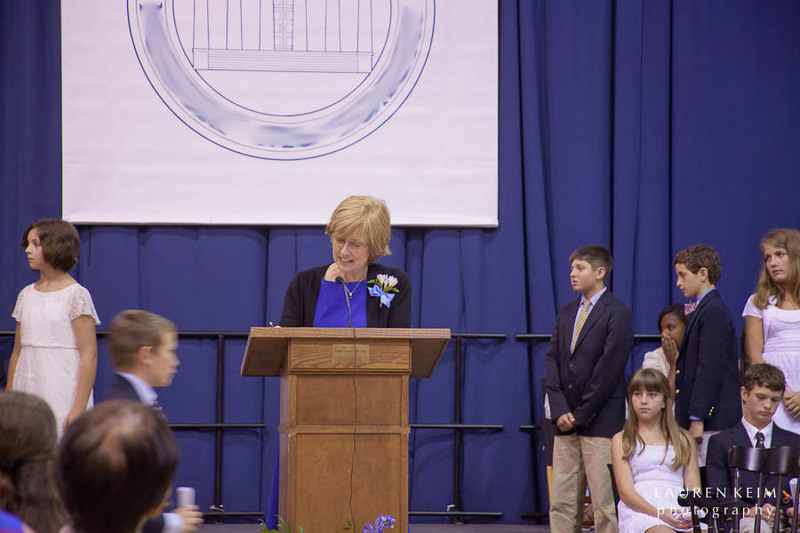 Cal's headmaster said to those kids at graduation (aside from emphasizing reading for at least an hour a day), "Be a Bulldog." That's a concept they can get. He knows what it means to "be a bulldog." To have honor and commitment and respect for himself and others. As long as he continues to strive to be a bulldog, who wouldn't be proud?